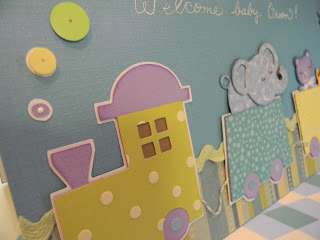 I added sequins for the steam, and hand-wrote the title of the card in white ink. The characters all got eyelets for the eyes, inking here & there, glaze smiles, and the yellow cart is dry-embossed. I also added ric-rac on the background, twine to connect the carts, and little felt stickers to the centers of the wheels in different sizes. It's great! So very adorable! What a great mom you are! 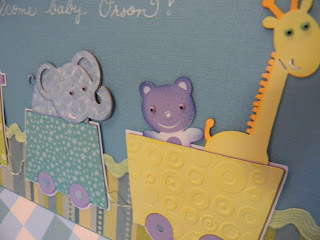 Such a cute card, love all the detail and the colors are really pretty.